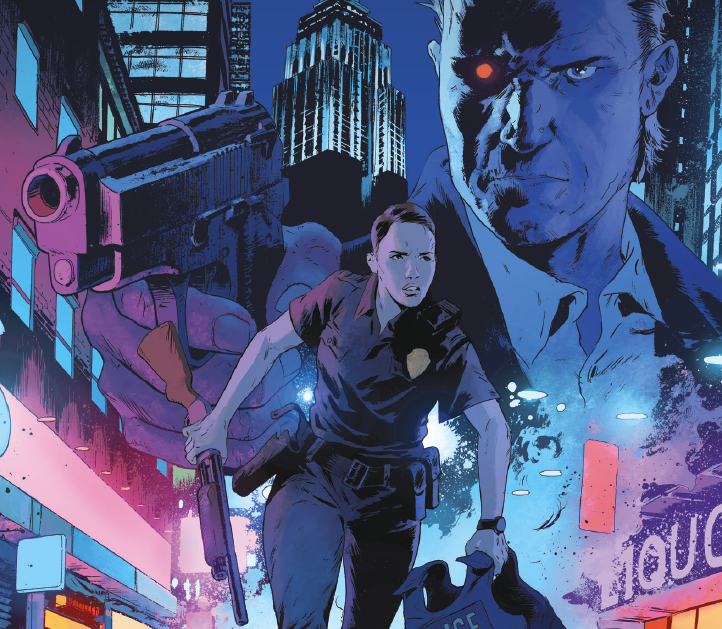 Killer robots and New York City: Brian Wood discusses his new mini-series 'Terminator: Sector War' – AiPT! Dark Horse Comics has a long history of publishing comics for some of the best franchises to come out of the ’80s: Alien, Robocop and Terminator being the big three. Growing up a sci-fi and comic nerd, I often found myself digesting content from one of those franchises on a fairly regular basis. So when I heard that Brian Wood (DMZ, Northlanders, The New York Five) was writing a Terminator comic, I jumped at the opportunity to pick his brain about it. AiPT! : Sometime during 1984 this story follows Lucy Castro, a rookie New York City police officer, through one of the worst neighborhoods in the city. I’ve noticed that NYC is a recurring theme in your work. We’ve seen it a number of times before: The Couriers, DMZ, Channel Zero and The New York Four. What is it about New York city that keeps bringing you back? Brian Wood: Well, it’s a bunch of different things… I managed to typecast myself as one of those New York City writers, which ain’t a bad thing, and sometimes that informs what jobs come my way. Related to that, I am so comfortable with and have such affection for the city that I’ll always take those jobs. I’ve lived here since 1991. It’s not just a location to me, you know? AiPT! : I wasn’t familiar with Jeff Stokely prior to reading this comic. To be completely honest, I was sold the minute I saw the punk in the Black Flag shirt, but it certainly helps that his artwork is fantastic. Jeff’s style is very gritty and has a distinct manga feel to it, almost akin to Miyazki’s work. It works great with your writing, but it’s not something I would initially have thought would fit this type of story. How did you guys come together for this project? Wood: It’s not something that’s been shouted from the rooftops – maybe it should be – but one of the initial concepts of this miniseries was to do something that is primarily art-focused, let the writer fall back into a supporting role. I wrote scripts that had enough space and built-in leeway for Jeff to do his thing the way he sees fit, and the results have been great. Jeff and Triona are both great, they deserve all the applause. AiPT! : Maybe it’s just me, but this T-800 seems to be more talkative than his friend in Los Angeles and even has some manners to him. Should fans expect a different type of Terminator than they’ve seen in the past? Wood: Nah, it’s the same model (fun note, in the script we call him Rolf, derived from Dolph Lundgren, a good 1980s counterpart to Arnie). But because this is a book and not a film, we couldn’t get away with the same sparse dialogue as in the film – it created a lot of empty-feeling scenes. So we built it out a little bit. AiPT! : One of my favorite parts of the original Terminator film were the flashbacks Kyle had to his time fighting in John Connor’s army against the machines. Will we be seeing any of those here? Perhaps with a child who has yet to be born? Wood: There’s no Kyle-type character in this story, so no. It’s really just Lucy Castro fighting for her life and trying to figure out what the hell is going on all on her own. That said, there are some interesting connections to the broader story; you may have to wait an issue or two to see them. AiPT! : As with Sarah Connor, Lucy Castro’s child, should it survive, will be very important to the Resistance. This immediately raised a lot of questions about the future of the Resistance and the motivations of Skynet. Do you feel confident that you’ll be able to tell all of the story you want to tell in four issues? Or is it possible we’ll see more from you on Terminator in the future? Wood: This is a complete story, but just like with the original film, it has an open ending that absolutely allows for sequels. So maybe? No firm plans right now. AiPT! : I’ve always felt that the larger message with Terminator was the warning that humanity’s arrogance and reliance on technology will eventually destroy us. Outside of the officer Castro’s survival, is there a larger message you’d like to convey here? Wood: Without giving away story stuff, I think Castro is grappling with something bigger than what’s in the moment, and I think they are closer to home than the example you gave. AiPT! : As a guy from Massachusetts who makes a yearly pilgrimage to Vermont for beer, I have to ask: Heady Topper, Fiddlehead or Hill Farmstead? Wood: You know, as someone who left VT before I was legally old enough to drink, I’m not sure I’m qualified to answer that. So I asked my sister, who stayed local, and she prefers Otter Creek above all, BUT of your choices would go with Heady Topper. Tell me how it goes! Terminator: Sector War issue #1 is available tomorrow 8/15.